Qdoba Catering Cheyenne: Make Graduation Season Amazing With Qdoba Catering! 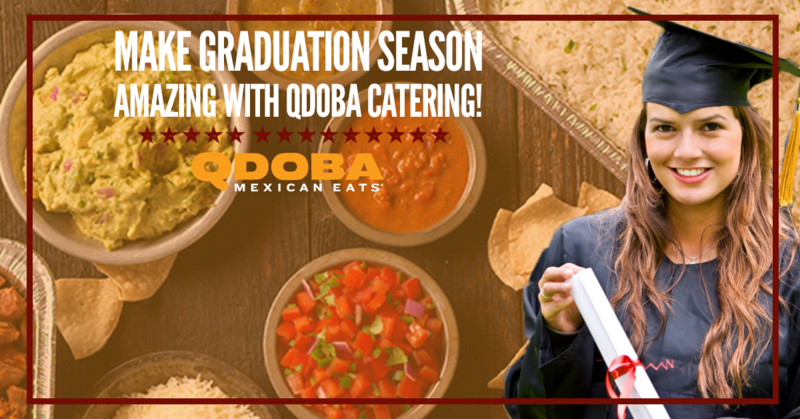 Make Graduation Season Amazing With Qdoba Catering! Spring weather is always a tease in southern Wyoming and western Nebraska. One day it’s warm and people are outside, riding bikes, playing ball, and imagining their summer vegetable gardens, and the next day there could be 12 inches of snow on the ground, and we are wondering if summer will ever get here if spring can’t even find a toehold! Trust us, summer will come! Glorious, warm days and nights that just ask for a party! Summer bring so many reasons to have a party, and a party deserves Qdoba catering! In the coming weeks, kids will be having prom, the end of the school year, and for many, graduation. Order up a Hot Taco Bar and surprise your graduate with a party for all their friends that you know they love. The best tacos in the world are those that you make yourself, with exactly the proportions that make your taste buds dance. And the best way to do that is to have options. Qdoba’s Hot Taco bar gives you great options. Hot Taco Bar Gives You Options! With just a 10 person minimum, this Hot taco bar is sure to please! You have a choice between Marinated Grilled Chicken or Marinated Grilled Steak. Our Hot Taco Bar lets you choose between delicious, crispy corn taco shells or a flour tortilla. The best tacos in the world are those that you make yourself, with exactly the proportions that make your taste buds dance. You can choose from three salsas: Salsa Rojo, Salsa Verde, or Pico de Gallo. Call us in Cheyenne today and reserve your date for a 2017 graduation party Hot Taco Bar!